GREENVILLE — A group of Greenville High School students and their parents participated in a ‘Life After High School’ tour to learn more about employment and living options after high school. 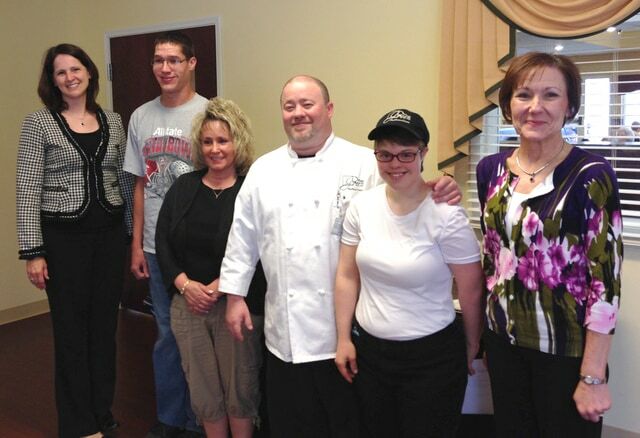 This tour was arranged by The Community First Department at the Darke County Board of Developmental Disabilities (Darke DD), in partnership with Greenville High School. To begin the day, students toured Kroger to learn more about job opportunities, employer expectations, and work skills needed for success. Kristen Alspaugh, associate relations manager, provided the interactive tour which allowed students to see job duties from the worker’s perspective. The bakery and meat departments were two of the students’ favorite areas and offered much discussion. The students then toured Village Green Health Campus and were led by Erika Smith (Environmental Services assistant) and Lauren Warner (dietary assistant). Smith and Warner are both thriving in their respective jobs and are served by Darke DD. During this tour, the students were shown areas behind the scene at Village Green, allowing them to learn more about the day-to-day operations. After enjoying a lunch prepared by Chef Matthew Gramlin (Village Green Health Care director of dining services), participants learned more about community employment through a panel discussion facilitated by Tamala Marley. Representatives on the panel included Kyle Eichelberger (Rural King), Kris Hurd (HR manager Rural King), Chef Matthew Gramlin, and Lauren Warner. Kyle and Lauren shared their journey to employment as participants in the Bridges to Transition Vocational Rehabilitation Partnership grant. Kyle went on to say that he “loves to work.” When asked about her work, Lauren replied, it is “awesome” and shares that she believes it is important to serve others. Students ended their day by visiting the home of a young man with disabilities who is working at Arby’s and lives in his own apartment. This tour was successful as it allowed high school students with disabilities the opportunity to learn about self-determination, self-advocacy and the value of community!